Smart Business needs OData Services with OData4SAP annotations to discover aggregate entities, dimensions, measures, parameters etc., so that it can be used to generate analytics. Currently the content build on HANA Live (through XSODATA) and ABAP CDS views only can generate odata4SAP annotations. OData service built on any other platform or technologies would not have these annotations. 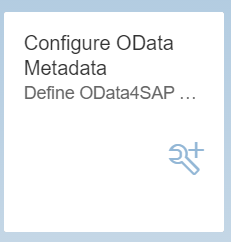 For supporting other OData services Smart Business has an adaptor tool that can allow customers to configure these metadata for analytical OData service to generate oData4SAP annotations. User should have an OData service and already configured the Service discovery on the corresponding Business system to discover this OData service. Provide the Data source Provide the information like, Source System, Service Discovery Mechanism and the OData Service.And click on submit. It will Show all the entity Type configured in the OData service. Select an analytical Entity Type for which you need to configure SAP Annotations. Provide the Semantics as Aggregation.Note: SAP Annotation Aggregation is required for discovering your entity Type in Smart Business Modeler applications. Configure Measures and Dimensions for the Selected Entity Type. Each properties in an entity type can be measure, dimension or empty as SAP Annotation aggregation-role.And for each properties user can provide a SAP Annotation label (Sales Order Item) which will be displayed in the screen, if nothing is provided it will take the technical name (SalesOrderItem).If user has any currency field in the OData service, then user can select the SAP Annotation semantics as Currency. Which can be used as the Unit of Measure for the measures. And if user has an ID field (Product ID) which is added as a dimension, but user wants to see the actual name of the field in the UI. Then user can choose the SAP Annotation Text (ProductName).Note: The properties which is selected as dimension/measure, only that will be discovered in smart business modeler application. Selection of input parametersProperties of an Entity Type can be used as input parameters to retrieve the entities of the OData service.Select the entity type that has the required input parameters from the Odata metadata and select the Semantics as ‘Parameters’ from the dropdown. Select the properties of the entity type which are to be used as filters from the parameters column. The user can now provide input values for the selected fields from the evaluation configuration. Note: The input parameters must be defined as properties of an entity type that is associated with the entity type to be retrieved. This step inserts the annotation sap:semantics=’parameters’ allowing the properties of the entity type to be used as input parameter. Click on Save to Save the OData metadata configuration. Smart Business Service is available in SAP Cloud Platform service section. This is also available in SAP Cloud Platform Trial Landscape. Hope you could help me understand a bit better what the difference between Aggregation and Parameters in Semantics? Thank you.